Heliocentric means Sun-centered, whereas geocentric means Earth-centered, thus the celestial bodies are viewed either from the point of view of the Sun or from that of the Earth. In geocentric astrology planets may appear to move backwards (they are then said to be retrograde), but in heliocentric astrology a planet is never retrograde. 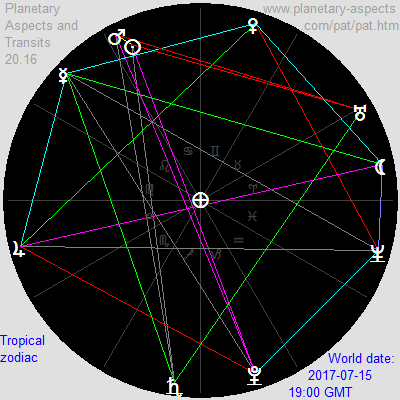 In geocentric astrology there are two zodiacs in use, the tropical and the sidereal, but in heliocentric there is just one zodiac. The Earth is at the center of the geocentric chart, whereas the Sun is at the center of the heliocentric chart. In the heliocentric chart the Earth is located next to Pluto at the bottom. In the heliocentric chart the Earth and Mars are on opposite sides of the Sun, whereas in the geocentric chart Mars is close to the Sun (because the Sun and Mars are in the same direction as seen from the Earth). 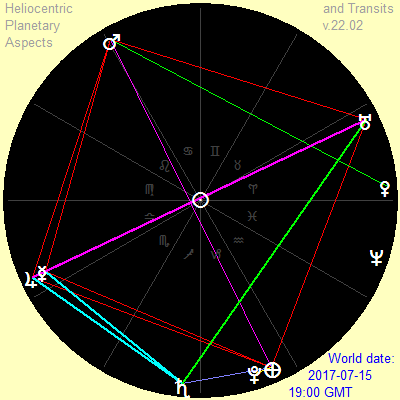 The outer planets (Jupiter, Saturn, Uranus, Neptune and Pluto) are more-or-less in the same position in both charts. That is because the distance between the Earth and the Sun is small compared to the distance from the Earth and Sun to Jupiter and beyond, so the positions (longitudes) of these outer planets are similar whether from the point of view of the Earth or of the Sun. The aspects are very different in each chart. 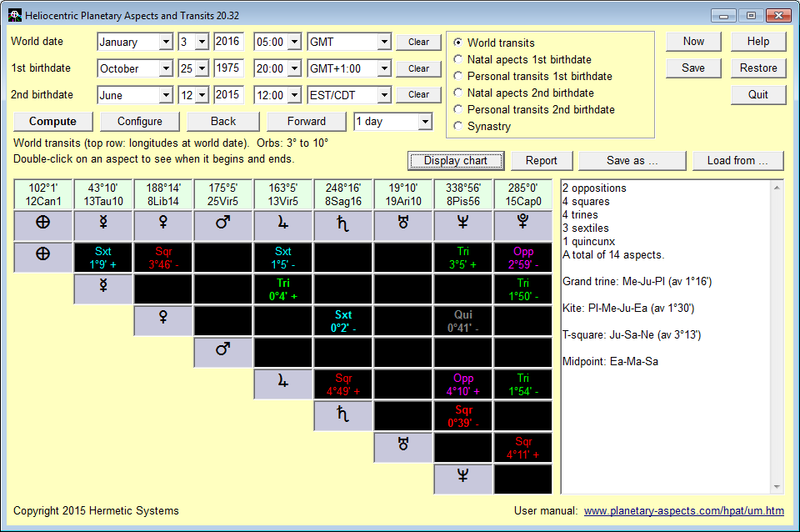 The heliocentric chart shows two grand crosses (not present in the other chart) and the geocentric chart shows two yods (not present in the other chart). Here is another example of the difference, the geocentric and heliocentric planetary aspects at 9 am EDT on 'Black Monday', August 24, 2015, at the start of the 1000-point drop in the Dow-Jones Index. 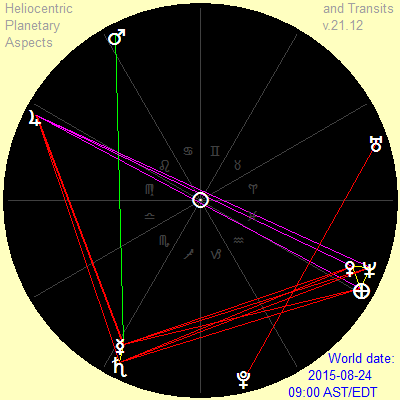 The six T-squares (each with a Mercury-Saturn conjunction at the apex) in the heliocentric chart would have suggested a bad day to anyone knowing anything about astrology, and for stock holders and pension funds it was indeed a bad day. 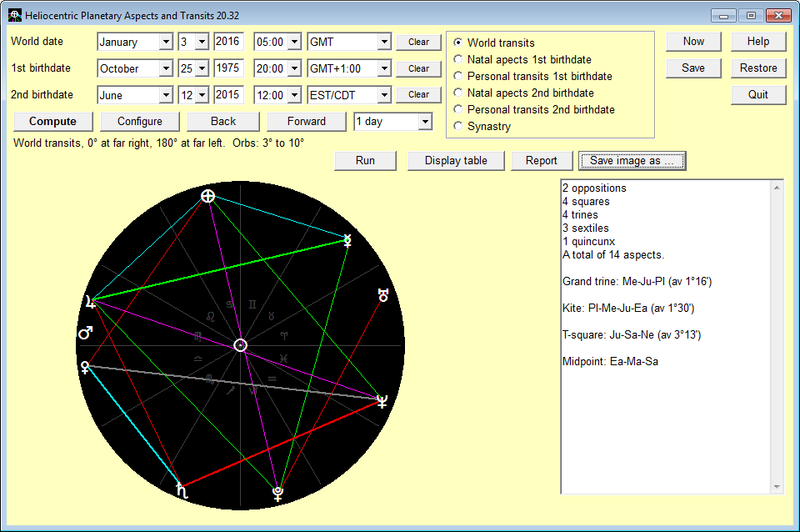 The geocentric chart, however, shows a grand trine, usually associated with a favorable situation. 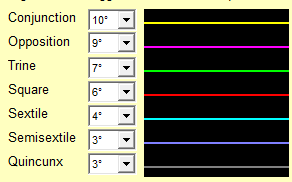 An angle value shows difference of the aspect from exactness (so 0°0' is exact). A '-' or '+' shows whether the aspect is decreasing ('-') or increasing ('+') at the date and time shown, or in other words, whether the aspect is applying ('-') or separating ('+'). Price and ordering: A single-user license is available for a period of 3 months, 1 year or with no time limit (a 'perpetual' license). Prices for each type of license are given at Purchase a User License. An activation key is required in order to make the trial version permanently fully functional, and can be obtained immediately (or soon after) your purchase. Refund: A refund will be provided promptly up to 30 days after purchase if the software does not perform satisfactorily. Updates: Purchasers of a user license for this software are entitled to an update to any later version at no additional cost.